Almost all currency is virtual — In that it relies on the people who are trading it to define its value. Thus we are an economy of taste by default, so it’s about time some startup owned the taste graph. 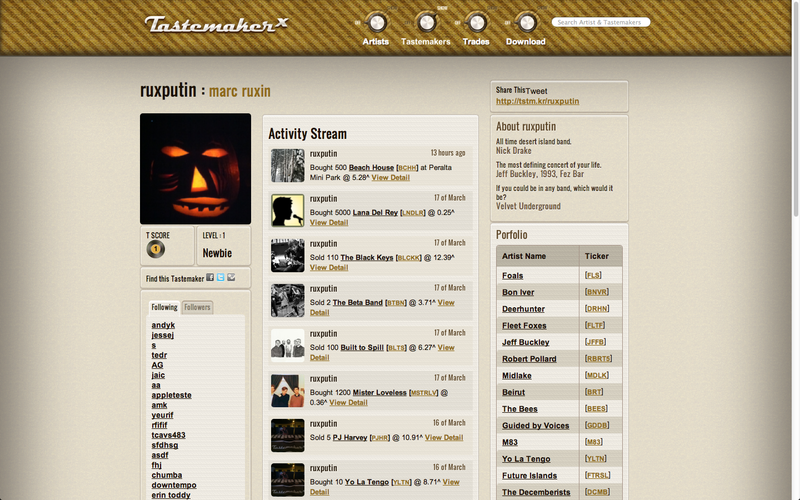 TastemakerX has the potential to be that startup, with its “stock market for bands” app allowing music snobs to build cred based on their early on talent-spotting. Like an Empire Avenue for the rock star-obsessed, TastemakerX lets you buy and sell shares in burgeoning musicians, earning “Notes,” or virtual currency which in turn let you buy more shares. TastemakerX attempts to quantify and add an interface to the immense social reward we experience when we spot something first. I mean it’s almost Darwinian in a sense; the humans who could spot the ripest berries early on would be more likely to spread their genes to the next generation. Anyways this “good taste,” whether it be in berries, or startups or fashion is merely the ability to pick a winner so to speak, and has concrete evolutionary rewards. TastemakerX attempts to glean your musical taste by asking you questions in onboarding flow like “What’s the best music show you’ve attended?” and “What’s your favorite artist?” It can also pull from the music in your phone and algorithmically suggest options for investment (Pro tip: Don’t do this). If you don’t like any of the suggested artists you can search for them manually or follow artists your friends are following. Sort of how taste spreads in real life. This and next weekend, lovers of music will descend up on Indio, Calif to attend the three-day Coachella Valley music festival. I am here right now and my objective opinion is you have to come at least once before you die, it is amazing. Because it is the music hipster Olympics, one byproduct of Coachella is unsung bands like Foster the People become cloyingly mainstream because it exposes them to lot of people who have the power to influence other people who want to know about cool bands. Picture Y Combinator, but instead of startups it was a cohort of bands like Girls, Dawes or Polica. Or here’s the closest real life analogy I’ve got: A long time ago my friend Facebook messaged me that Gotye “Somebody I Used to Know” song, and was like “This song is going to be huge!” If only he were able to trade on that skill. TastemakerX has three core components a) the band stock exchange b) the data play on the test graph c) a social part of the app — like Soundtracking except for bands. In its barebones form it isn’t that impressive from a UI perspective, but what excites me the most about the idea is that CEO Marc Ruxin hopes to expand it to other verticals soon. I think it would be amazing and extremely helpful to investors if there were a TastemakerX for startups. Funny enough, Ruxin tells me when he was pitching the platform down on Sandhill, VCs would often ask him to make one for wine. Perhaps all you really need to know is that the startup is funded by Baseline’s Steve Andersen (among others), who just had an early stage double-header with OMGPOP’s ‘Draw Something’ and Instagram, and that it plans on monetizing by holding sponsored Notes and racking up partnerships with brands and events. On Sunday it will post on its own webpage which bands are currently “trading high” on Coachella. Also, oddly enough there are a lot of tech people here in Indio; Because they’re (we’re?) the new rock stars.